The 1992/93 academic year at the Mathematical Sciences Research Institute was devoted to Complex Algebraic Geometry. 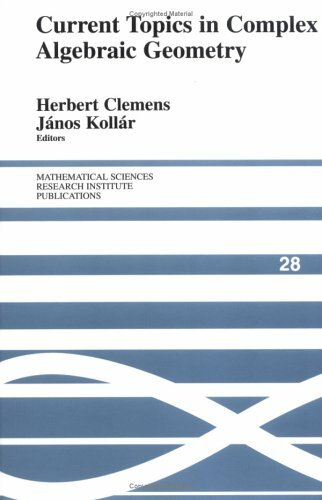 This volume collects survey articles that arose from this event, which took place at a time when algebraic geometry was undergoing a major change. To put it succinctly, algebraic geometry has opened up to ideas and connections from other fields that have traditionally been far away. A monograph on homogeneous spaces of algebraic groups and their equivariant embeddings. Some results are supplied with proofs, the other are cited with references to the original papers. The style is intermediate between survey and detailed monograph. This is an introduction to the arithmetic theory of modular functions and modular forms, with an emphasis on the geometry. Prerequisites are the algebra and complex analysis usually covered in advanced undergraduate or first-year graduate courses.